Dragomon Hunter is an ambitious title from X-Legend and published by Aeria Games, in which I do not ever know which state the game is in: Alpha, Beta, or Live. 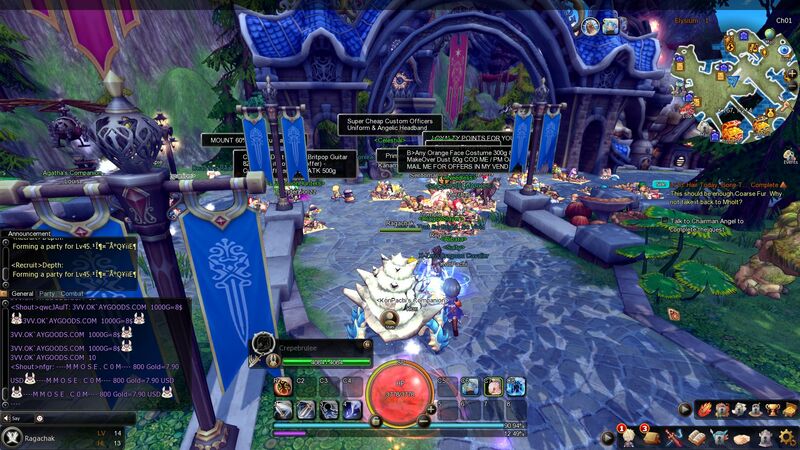 But it appears that Aeria titles seldom leave that Beta phase. 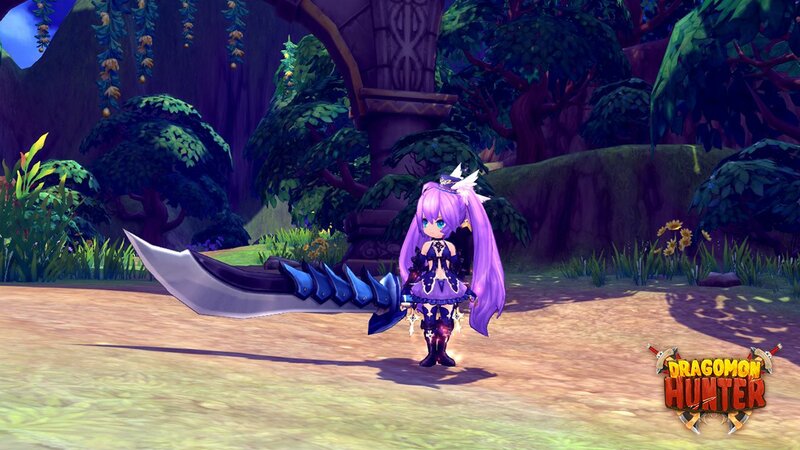 Dragomon Hunter is part cutesy Ragnarok Online, part Pokemon. The goal of the game feels kind of unclear, other than to tame Dragomon, which are the monsters that run amok in the world. There are “dungeons,” there are missions, big bosses, crafting, guilds, all of the stuff you could and should expect in an MMO, but I’m a trifle unclear on what I’m supposed to be doing. 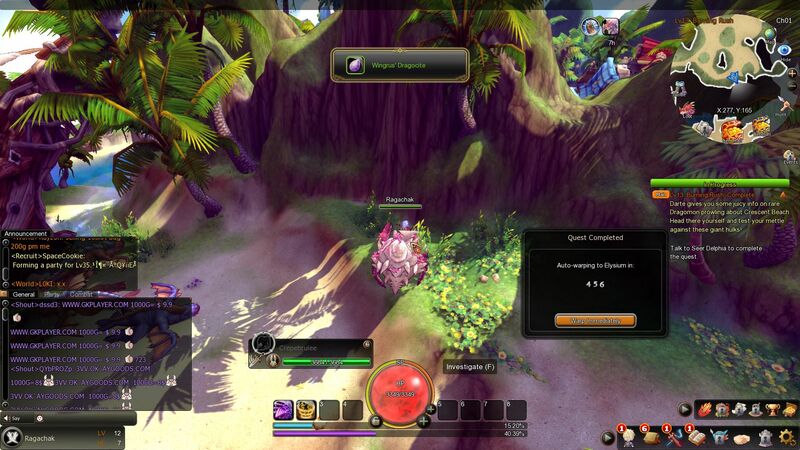 Generally speaking, MMOs have an overarching goal, an end-game to reach for. This feels more like a casual game, where players get together and kill monsters and collect Dragomon to use as mounts. The game teased me with “combat mounts” that get cool abilities when you’re upon them, but I’ve yet to find a single one other than the quest that showed it off to me. There is still a lot you can do in Dragomon Hunter, for good or ill. 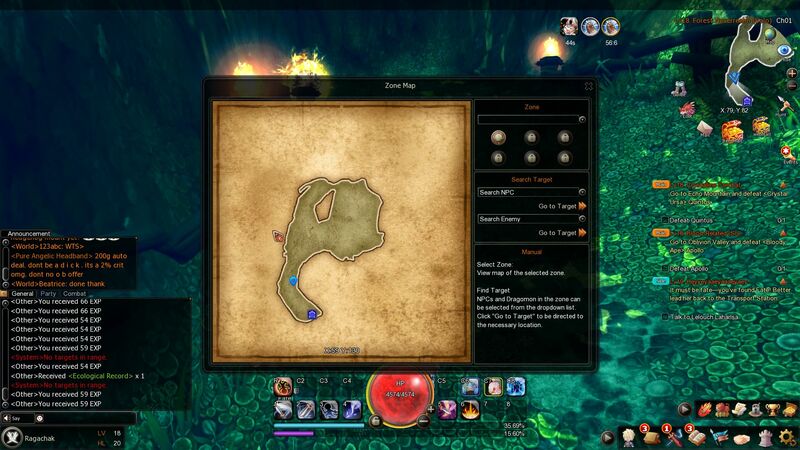 There is an arena to fight powerful and dangerous Dragomon, as well as 3v3/5v5 PVP to look into. Bounties, cool events, rewards for logins, and so on. But it’s . . . easy. Incredibly easy. Pretty much every class does boat-loads of damage, though at least the art is bright and cheerful, filling you with a bit of energy as you decimate your foes. Perhaps too cute and cheerful at times. You hang out primarily in the city of Elysium, where everyone idles and tries to sell their rare items and gold-sellers obliterate main chat. Typically the chat moves too fast for me to ignore/report people, and there are so many independent merchants (players) that even my PC slows to a crawl when I’m in town from time to time. Back to the actual gameplay. It’s cute and it’s fun, but it’s so easy to play. The only thing that killed me reliably were level 50 boss monsters, and that’s only because I was 30-40 levels under them and ran through trying to be a badass. There are lots of items to craft and collect, and a fair amount of Dragomon with a few different species, but ultimately I feel a bit disenchanted. It’s still very buggy, and halfway through my playtesting I could swear there were huge stealth nerfs to drop rates, meanwhile I can autowalk myself to pretty much every quest objective. Dragomon Hunter has four classes: Mercenary, Scout, Cleric, and Mage. At level 20 you can get a different weapon type to use, and each has its own unique skill set. Some of the skills are pretty familiar from other MMOs, but really, there’s bound to be overlap. The classes are pretty fun; in the first phases of the beta I played a Mage where I teleported around and shot ridiculous blasts of energy at my opponents, and in the latest version I dabbled with all four. You can go up to level 50, but there are two levels per character. “Character Level,” which affects what you can do in-game (dungeons, quests, professions), and HL levels impacting stat growth. This determines if you can tank, deal damage, whatever you want to do. Each HL gives you a stat point to put down as you’d like. The best way to level is to do the Main Quests, but there are daily events, dungeons, bounties, and other things of that nature. You aren’t alone though! When you create your class, you also create a Hoppalong: A cute little bunny creature that can have its own character classes depending on what Primers you find in the game. Thankfully you can give them your unused equipment. If they die, they resurrect after a little time has passed, so take heart, little buddy will come back! I couldn’t find a party to do dungeons, so I soloed a few times, and I have to say, I was completely underwhelmed. It was one tiny grotto, with a bunch of Dragomon that were actually aggressive, and when I completed it, I just left. The rewards were mediocre at best. It would appear that the way to get gear is to do quests, craft it, and/or upgrade it with scrolls and other items. When you upgrade a piece of gear to a certain point it can go up a Star, with a maximum of five. 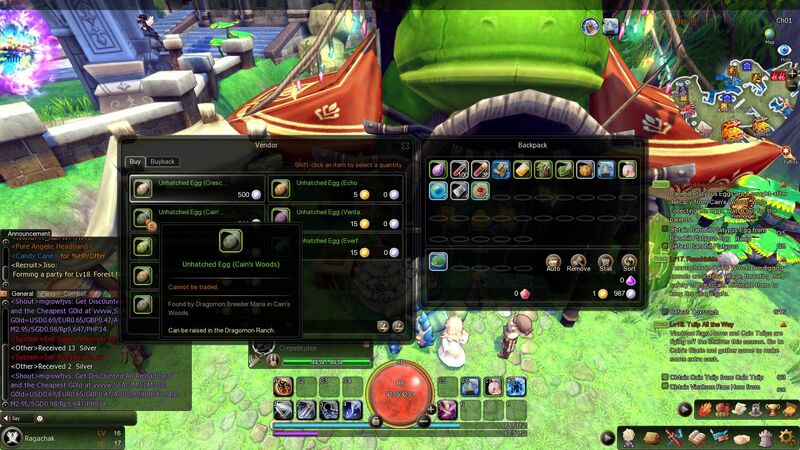 So you have to kill copious amounts of Dragomon for crafting mats, or use “Dragomon Points” to trade for resources/other useful things. I still have no damn clue how I get Dragomon Points though. I have some! I’m just not clear on where you get them. 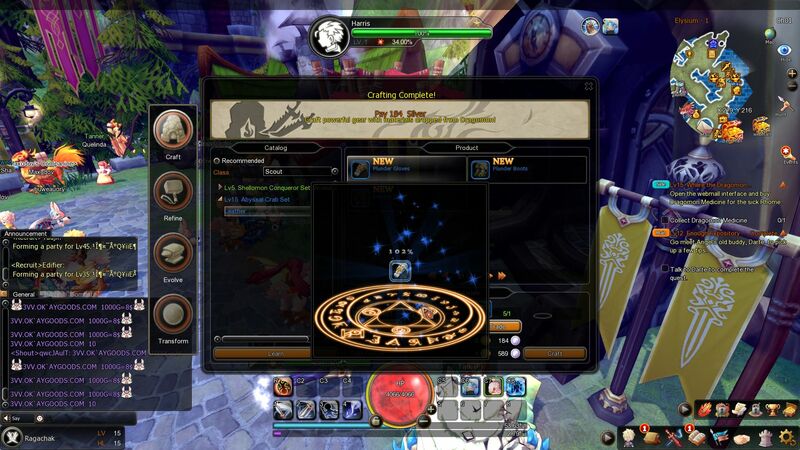 Entering missions is all portal based. You ride a helicopter/enter a portal to a zone to do quests. There’s no real world exploration, and that’s kind of boring to me. Sure, it’s fun to hop into a zone every once in a while, kill some enemies then go hang out with your friends, but I feel kind of detached, not immersed in this cheery world. I have a hard time feeling like something’s direly wrong in the world of the Dragomon with how colorful and bright it is. Unless perhaps the great terror is me, unleashing hell upon the innocent creatures! Bounties and other quests for faction reputation gain were on boards in Elysium, and you gain a pretty large amount of rewards for completing them. The exp is not as good as the main storyline, but you get crafting materials and chests with ore, or other useful bits in them. At least the early parts of the game guide you to the bounty board, craftsmen and other parts of the game, so you know exactly where to go and what to do.
. . . But. This game is still insanely easy. If you have a crafting mat in your bag you can right click it, and it will “Search for Master Craftsmen” and ride you to a craftsman in the area you’re in, where you can get to work. You can left click on quest objectives on the right side of your screen, including the items to dig up/grab/capture things and it will hop on whatever mount you have and take you to it! Sometimes you get stuck on things but for the most part, it accurately takes you exactly where you need to go. And so few enemies are aggressive, you can alt-tab and do something else. I enjoy having some manner of an idea where to go, the sparkly trail that lines your path is pretty handy; but why use that when you can just click and ride for free to your objectives? The game gives you tons of crafting mats and items that you can use, but you have such a tiny inventory; early quests give you a few bags, but you’re on your own after that I feel Not to mention the mounts you collect TAKE UP INVENTORY SPACE. In the early phases of the beta, I had something like 10 mounts, and that’s a LOT of inventory space. You have a ranch… but do your mounts go there, and can you summon them there? Nope! That’s a whole different part of the game. 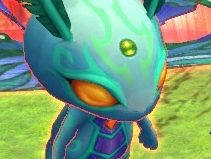 You can raise and breed Dragomon there, using eggs you find, or Dragomon you tame. While testing there were four key components I found at the Ranch, though it seemed hints of more functions were in development. Defense, where your Dragomon will defend the Ranch against attackers, but you have to help; they can’t do it all on their own. The Pasture is where Dragomon go to grow. When they get to 100% EXP they can be bred at the Breeder. You can also go to Omi the cook to make meals for your Dragomon, which helps them level up but they are, like many creatures, picky eaters. Pay attention to what their dietary needs are! This is such a cool concept, but I often find myself forgetting about it. You can also “Record” Dragomon/Eggs here. After a day you will receive a reward for doing this, and I do not believe you get these Dragomon back. You can get gear, mounts, lots of different things! So if you have more than one of a type of Dragomon, or you simply don’t care for it, feel free to Record it away. Or you can release Dragomon, but once you do that they’re gone forever too. Thankfully, it’s shared across the server, so all of your characters have one Ranch to take care of, instead of several. When I say I’m not sure if it’s still in Beta, I mean it! 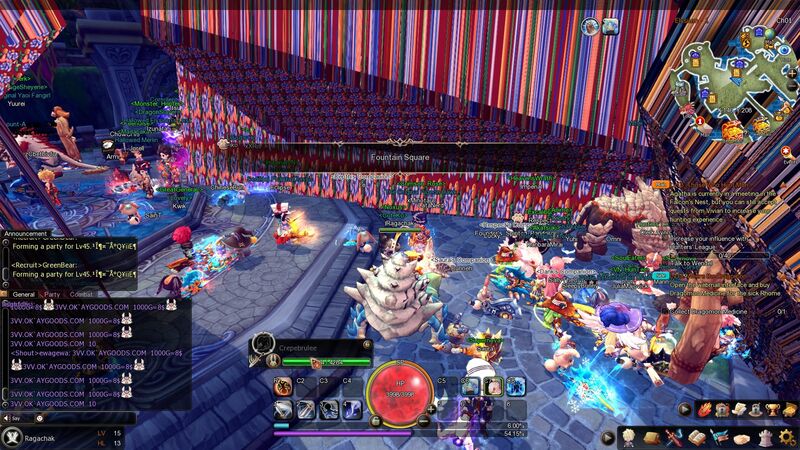 I have some serious issues with a game that suddenly gives me gigantic blocks of glitch graphics in the main town! Sudden walls of graphical errors, as far as the eye can see. Changing my camera view doesn’t help, nor does moving around it. It has controller support, but I honestly was not a fan. It was a much better experience with a keyboard/mouse. It has cute voices, but the English voices made my teeth itch. But that aside, the game is fun! It’s undeniably fun to dash into combat and slap the crap out of enemies to tame them. 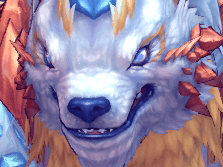 I detest the sudden lowered chance to grab mounts, but when I had them I was equally frustrated because they all take up space in the inventory, so it’s a double edged sword, but one pointed at you. It’s got a lot of potential, but it needs a bit more than polish. It’s too single-player to be an MMO as things stand, although its just released 300v300 PvP battleground is a step in the right direction. Unfortunately I found most of my time in-game spent standing in front of a bulletin board, and that’s no good. Dragomon Hunter is cute and fun, but I feel like I’m doing the same things in the same zones, no matter how long I’ve played. To “catch ‘em all” you have to spend hours farming them. That’s not interesting. 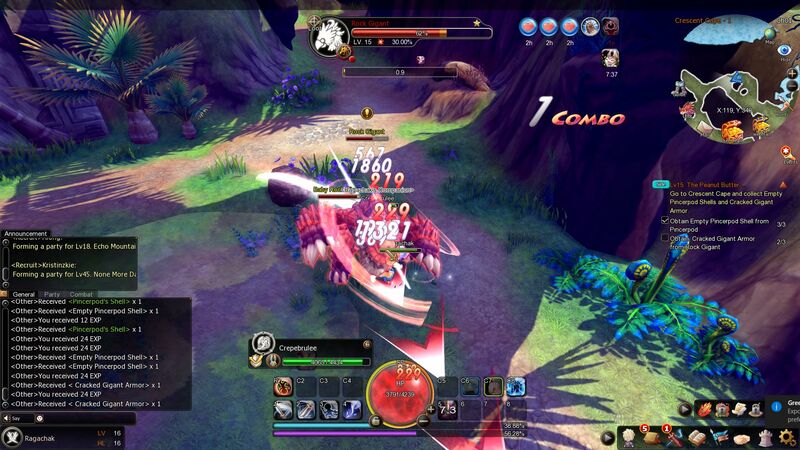 Though at least combat is considerably similar to other X-Legend titles, like Aura Kingdom, which is solid for the Anime MMORPG genre. If you’re a fan of those, you will probably still enjoy Dragomon Hunter. + Combat is fast-paced, character skills are very cool and unique. Big numbers are fun and you get a lot of them early on. It’s insanely repetitive, and you have to spend a LOT of time in combat to farm Dragomon. Combat might be fast-paced, but it’s also incredibly easy. + Music is of a pretty decent quality. The Japanese voices are fantastic, and are a pleasure to listen to, even if they just pretty much say the same thing all the time. They say the same thing all the time. The “voiced dialogue” is pretty repetitive, and I really got tired of hearing the same music after a very short while. It’s upbeat and fun, but drones. + Controls are decent; they’re pretty responsive with keyboard and mouse controls, goes well with the action of combat. WASD, QE to rotate, or use your mouse. You can use a controller. But you shouldn’t. Controller use in this game was absolutely effing abysmal. I found myself needing to switch from controller to keyboard and that’s not good. I wanted to like the controller for it, but nope. + Lots and lots of things to craft, and the bank has a ton of slots of materials. You don’t need them in your inventory! That was such a Godsend. I think the only item that you have to have on hand are scrolls or Dragocite (Gems to improve gear). I outgrew crafted gear pretty swiftly since leveling is so damn fast. I don’t see the purpose of upgrading gear at low levels, since better stuff comes along and wastes all the mats I dumped. That’s an incredibly frustrating feeling.